I’ve been thinking for a long time now whether I want to open a real brick-and-mortar Korean restaurant of my very own. Assuming yes, what kind of restaurant would it be? I’m swimming in ideas and I want to do them all now. I’m in that particular moment of brainstorming that is heady with possibilities, where you get slightly dizzy and sometimes turned around, waiting for that moment when something grabs you by the shoulders and stops you so you can see clearly again. For me, that moment of clarity often comes when I'm inspired by a place that makes me think, damn, I wish this were my restaurant. Where I feel the chef has basically dropped the mic, and all wannabe contenders like me should bow down and go home. This year, I’ve dined at three modern Korean restaurants that I found particularly inspiring. These three restaurants are quite different from each other – diverse in their approach to cooking, the ambiance in their dining rooms, their aesthetics. One is a no-frills shopfront next to a 7-11 in a Los Angeles strip mall; another is a light-flooded aerie perched atop Namsan mountain. One plays with contemporary techniques offering complexly rich dishes, while another adheres to a warm minimalism. For me, it’s fun to see how varied the playing field is for elevated contemporary Korean cuisine. Ultimately, however, they all share a profound respect for Korean culinary traditions and ingredients that binds them together. After I had lunch at Baroo in Los Angeles earlier this year, I declared to everyone who would listen that it was the best Korean restaurant I had ever been to. Then I met chef Kwang Uh who opened Baroo with his friend, Matthew Kim, and it turns out he refuses to describe Baroo as a Korean restaurant. Oops. The chef says people are quick to call Baroo Korean just because he is Korean and he uses Korean ingredients, but he shies away from the label because his cooking is definitively not traditional. He doesn’t want people to go to his restaurant expecting typical Korean food and be disappointed. Chef Kwang is too modest. Since Baroo opened in late 2015, it has generated a huge buzz among the food cognoscenti and in August 2016 was named the No.5 Best New Restaurant by Bon Appetit magazine. The menu is primarily plant-based and each dish is intricately constructed from a whirlwind of fermented and fresh vegetables. You can see the meticulous testing that went into each element of each dish, such as the shaved macadamia on the bed of kamut and farro slathered in nuruk (or Korean fermented soybean that's typically as a starter for making soy sauce). Or his “bibimbap” which includes pineapple kimchi, purple potatoes, basmati rice and a gremolata inspired by a prolonged stay in Bra, Piemonte at the Slow Food headquarters. The sophistication of the dishes is in juxtaposition to the location, which is next to a 7-11 in a strip mall in a neglected corner of Hollywood. The atmosphere is extremely unassuming, and the menu of less than 10 dishes is scrawled on a chalkboard. On the counter by the door, there is a small sign with a drawing of a baroo (a Buddhist monk’s bowl from which the restaurant got its name) and the prayer said at the formal Buddhist meal. 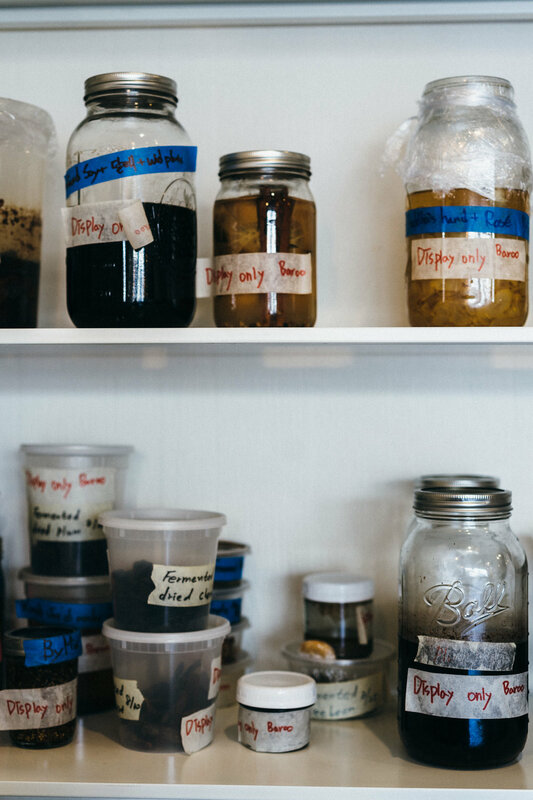 My favourite part of the restaurant is the back wall lined with shelves of jars and tubs holding their bubbling, fermentation experiments. Chef Kwang and his partner opened the restaurant on a shoestring and for six months were the only ones manning the restaurant. At the moment, they have two more staff while chef Kwang is in Korea for an extended period of time to work with Jeong Kwan seunim, the Buddhist nun that I was visiting last week. (More on her in a later post...) Meeting chef Kwang there was such a surprise and pleasure. It was a couple of days before I learned that the man who was making us breakfast was the chef of Baroo. He is unpretentious, curious, smart and especially humble. He's also incredibly articulate. I heard him give a master class to students of the Korean Creative Culinary Institute in Jeonju, Korea. While I was there for moral support, I couldn't help but be inspired along the young chefs-to-be of Korea as he shared his personal stories and made us consider what Korean cuisine means or should mean. Chef Kwang is going back to Los Angeles this week for a short time to participate in a citywide event for LA Weekly and to formulate a new menu for the restaurant. If you are in Los Angeles, go go go and try to catch him, or at least try his new dishes and report back, please. I had been trying to book chef Mingoo Kang’s restaurant during my visits to Seoul since it opened last fall. Getting a reservation proved challenging. Mingles is in the swish neighbourhood of Cheongdam-dong in Seoul, and has been declared the best restaurant in Korea in 2016 by the World's 50 Best Restaurants team and No. 15 in the world. Once a hotel concierge actually laughed in my face when I said I wanted to book Mingles during my stay. I tried to book again, a friend tried, we both tried again, and finally, four months later, I got a booking for a Monday at lunchtime. It was worth the wait. I’ve been to several celebrated Korean-inspired restaurants that were underwhelming. I felt sometimes that dishes were more about the concept or technique than the actual taste. Or that certain techniques were now outdated and not that interestingly deployed (foam anyone?). I rarely leave these multi-starred restaurants with degustation menus (Korean or otherwise) feeling like the food is something I would crave. Mingles, on the other hand, was luxurious and creative, but most importantly, the food was delicious. I was even floored by the bansang course of the tasting menu I had, which is a relatively straightforward course (rice accompanied by soup and various tiny dishes filled with pickles, seasoned fresh vegetables, and other side dishes). Each bite of the bansang was pitch perfect. The seasonings and the composition of each side dish were thoughtful and balanced. I wish Mingles would deliver that tray to me every day from Seoul. Our meal ended with a selection of traditional herbal teas and the earthy dried burdock tea I had was the perfect quiet ending. 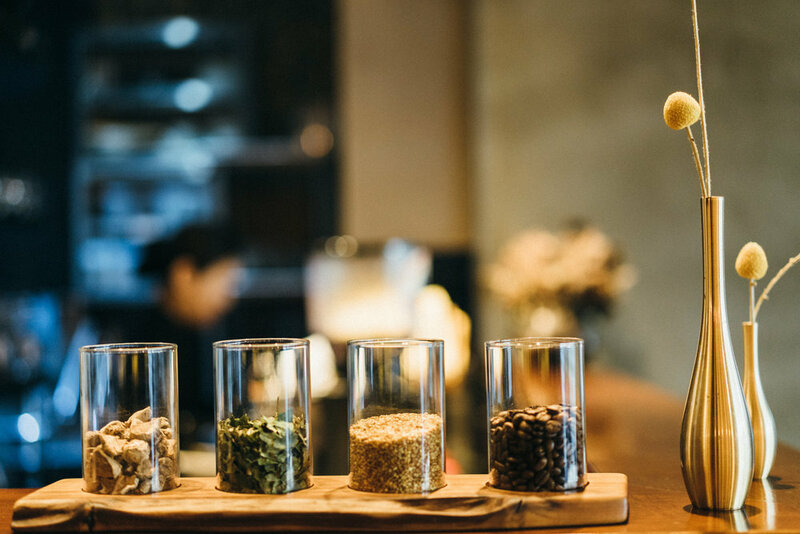 Chef Kang clearly has a deep respect for local ingredients, from the dried burdock to the new spring vegetables he wove into the menu. He is inventive without rendering the ingredients unrecognisable. 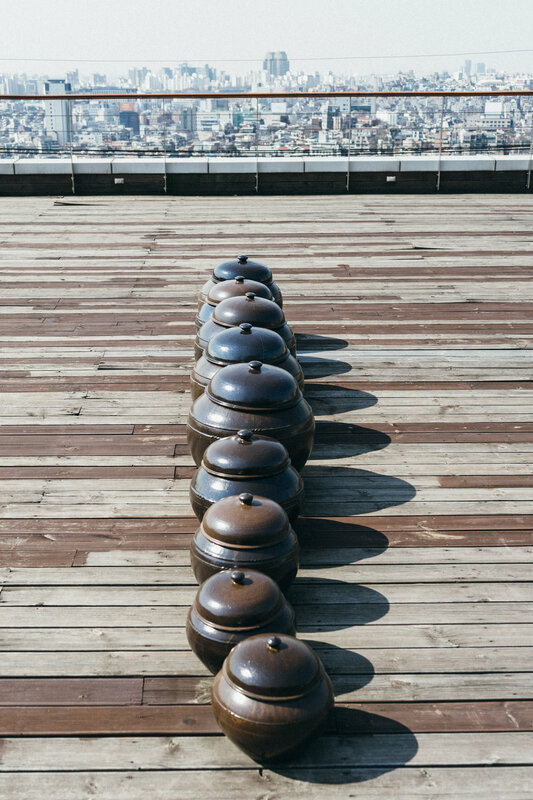 He pays homage to Korean traditions as he plays with them. He champions Korean food traditions internationally and interestingly is also learning temple cuisine from Jeong Kwan seunim in a six-month course with other Korean chefs. I have my fingers crossed that I can get another table there sometime soon. Poom opened almost ten years ago and rests on the Namsan mountainside with gigantic windows have views over the rooftops of Seoul. The menu adheres more to traditional flavours, but is elevated to a level that I had never had before I went the first time. Eschewing modern technical fireworks, it’s the seasonal, local ingredients that are left to shine. Poom makes its own soy sauce, among other things, on site; and on the roof terrace, you can see the clay jars where they ferment the soybeans and other goodies. Everything about Poom is clean, immaculate, practically monastic, but manages to avoiding being austere. Each dish is served very simply on the most gorgeous handthrown ceramics and brassware made by celebrated Korean artisans, sometimes with a small leaf or petal placed just so. 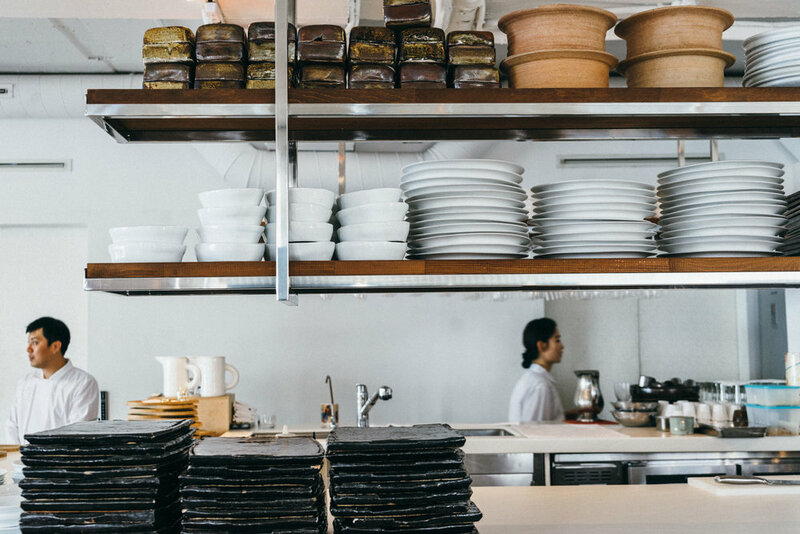 The chef-owner Roh YoungHee may have been the first Korean food stylist as we know it today, and is one of few recognized female chefs in Korea. I was lucky enough to have tea with chef Roh in her private cooking studio on my last trip to Seoul. Basically, she is walking down the path I have just started on. She is not a trained cook, but always loved to cook for friends (just like me !). Then her friends encouraged her to cook professionally (again, sounds familiar!) which eventually led to her opening Poom. She is obsessed with ceramics and collects them whenever she can (check). Her private cooking studio is lined with shelves stacked with ceramics from floor to ceiling (I’m getting there). In this dream studio, she teaches cooking classes and offers private kitchen dinners, plus she loves dogs (check and check). And she has just opened up her own ceramics shop downstairs from her studio (sigh). When we talk about the transition between our past lives into cooking, she says, "how lucky are we to do something that makes other people happy while making ourselves happy." Indeed. Poom was the first restaurant I went to that showed me the possibilities of contemporary Korean cooking. If I could ever pull off a restaurant that could dare stand in a corner of its shadow, or that of either Baroo or Mingles, I would be grateful. In the meantime, I’ll keep spinning ideas in my head and looking for more inspiration.